Phase II of Jeeves Holiday Homes Includes Lobby Sign and Door Graphics! When you welcome clients into your building or suite, you have a great opportunity to impress them and force them to remember you. One way to do this is with signage that really pops, such as lobby signs and other graphics. 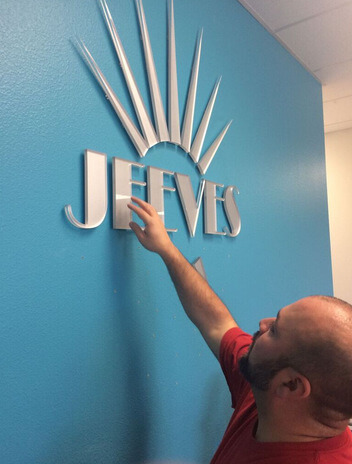 Jeeves Holiday Homes realized this, so they contacted the friendly experts at Citrus Sign Studio for lobby signs for property managers in Orlando, FL. Orlando’s premier property management company is Jeeves Holiday Homes. They have specialized in supplying Central Florida with high-end, first-class vacation property for over ten years. The have a one of a kind collection of vacation homes that are all situated in close proximity to Disney World. Plus, there is a private pool on the property of all of their homes. In addition, some of the properties have theater rooms, beautiful views, and game rooms. We were more than happy to help a business that provides individuals and families with such great vacation experiences when they contacted us for lobby signs and frosted door graphics for property managers in Orlando, FL. This was not our first time working with Jeeves. In fact, this was Phase II of a much larger project. Previously, we printed and installed window graphics at their new location. Now, we were improving the interior décor. Installing their new lobby sign! Before we began Phase II of the job for Jeeves, we met with the client to get a good understanding of what they had in mind for the project. We then went back to our shop and created some mockups of what their finished signage and graphics would look like. Once they approved of these proofs, we went to work fabricating the markers. The lobby sign is made of acrylic and measures approximately three feet by five feet. 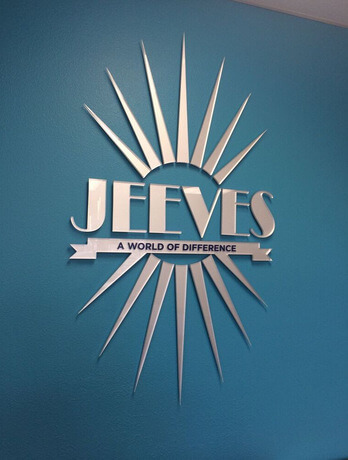 The acrylic perfectly captures the Jeeves logo and projects their image as a professional property management company. 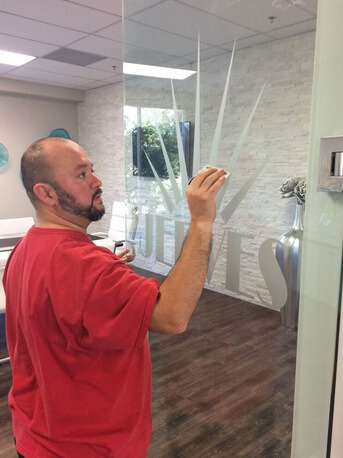 The frosted vinyl door graphics continue the branding while adding an elegant touch to their new offices. We worked with the client’s schedule to install the markers at a time when there would not be any customers around, so we would not disrupt business as usual. In the end, Jeeves was again completely satisfied with the work we did. At a fraction of the cost of paying a professional to etch your glass windows, you can achieve the same look with sophisticated frosted vinyl films. The signage material is growing in popularity throughout Orlando because of its many varied uses. 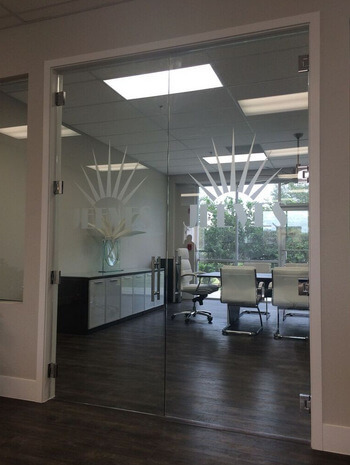 If you have a conference room that is surrounded by giant floor-to-ceiling glass panes, you can lend a degree of privacy to your meetings by installing etched vinyl film. We can even incorporate your corporate logo into the design to help boost your brand recognition. If you are interested in improving the interior décor of your office, contact Citrus Sign Studio today to learn about what cost-effective solutions we have specifically tailored for your enterprise.